Following up from my post earlier this month, Polycom’s SoundStation 2W batteries are being recalled. You can remove the battery and continue using the conference phone with the AC adapter. This entry was posted in Uncategorized on February 28, 2006 by jjackson. Trying to keep up with the myriad of products available for the telecom consumer is challenging at best. I’m trying to figure out how I missed out on this product though. I’ve been party to the occasional conference call and haven’t been really impressed with the hardware used. The voice quality wasn’t always what I expected. Sometimes it was tinny, sometimes distorted, sometimes far away depending on where the speaker was positioned on the other end of the call. Makes me wish we were using Polycom VTX 1000 Conference Phones back then. These models are designed to be able to pick up speakers up to 20 feet away from the microphones and offer full-spectrum sound. This is kind of neat – because full-spectrum sound refers to the hearing frequency range of us humans. 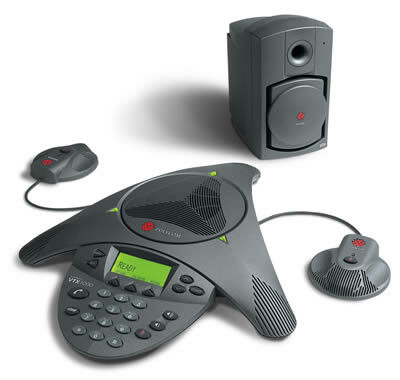 The Polycom VTX 1000 can reproduce frequencies from the bottom to the top of the human hearing range, resulting in fuller, richer sound reproduction. Polycom says it’s like having the other person in the room with you. I can’t vouch for that, but it sounds like a really great idea. I can’t wait to get my hands on one. I know we’ve sold a bunch of them lately. That’s probably because there’s a $100 rebate on them from Polycom. So, buy one from us and you’ll get a cheque from Polycom for $100. The special lasts until March 31 and applies to the Polycom VTX 1000 and the SoundStation 2 EX. For the first time – pricing! Well, this is a huge development in the history of Telephone Magic’s website. You see, because our prices fluctuate often – sometimes daily – and depend on the volume of product purchased, management felt that it wouldn’t be in our customers’ best interest to post a single fixed price on the website. However, I’ve bugged them for a while and am pleased to announce the introduction of pricing on the website. It’s a first – and I’m pretty proud of it. We’re doing a test in the phone headset section as a trial to see how it goes. In other words, does adding pricing make it easier for people to make a decision about buying from us? Does it reduce the friction in the purchasing process? Or does it encourage tire-kicking? I don’t know the results yet, but prices are here at least. The biggest difference though is we have stated a maximum price. In other words, the price shown on the website is the most you would pay if you ordered a single unit. If you were to order more than one headset, or combine it with a telephone purchase, the price would likely drop a bit. That’s why it’s only a maximum price. That way, we can still offer the best prices possible to our customers while making sure we don’t overcharge for items that we get special manufacturer pricing on. What a deal! I hope you visit what we consider one of the Internet’s leading telecommunications product websites today. Thanks! Visit www.TelephoneMagic.com for all your business telecom requirements. This entry was posted in Uncategorized on February 13, 2006 by jjackson. Polycom has announced that for the present time, shipments of the popular SoundStation 2W wireless conference phone are on hold due to a potential issue with battery safety. This situation only affects the SoundStation 2W as other Polycom products use a different battery pack. If you HAVE a SoundStation 2W, you can still use it safely if you remove the battery and use the AC adapter instead. Keep the battery and store it in a safe place. Polycom will be issuing further instructions soon. They say their next information update on this situation will be no later than February 10, 2006. Telephone Magic carries other wireless conference phone options from ClearOne (ClearOne Max & ClearOne MaxAttach). This entry was posted in Uncategorized on February 3, 2006 by jjackson.